Named to the Canadian-American team in 1975, the National “B” Team in 1976 and promoted to the “A” Team in 1977, Peter Patterson’s skiing career was plagued with serious injuries. When Peter Patterson was a young child, his parents built a home on the north side of Sun Valley’s Baldy Mountain. This meant summers of swimming, fishing and tubing in the river which ran right by their home and in the winter, skiing. Sun Valley changed ownership and the Warm Springs area was developed. The Pattersons then moved to the side of Penny Mountain near Ketchum, Idaho. Jack Simpson was the coach of a children’s program there where the ski club had a Mitey-Mite tow. He was assisted for a time by Christian Pravda. However, Pravda with his nonsense nature struck a responsive chord in the Patterson children. Peter Patterson was a junior alpine racer for the Sun Valley Ski Club in 1973. He was hurt in mid-season and unable to ski in alpine events for the rest of 1973 and all of 1974. Training with the Junior Nordic Team in the Intermountain Division in 1974, Peter skied cross-country in the Junior Nationals. Patterson was named to the Canadian-American (Can-Am) in 1975 and was promoted to the National “B” Team in 1976 and to the “A” Team in 1977. 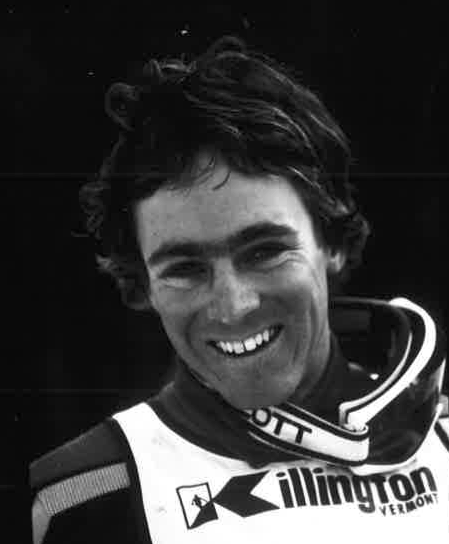 A member of the 1976 U.S. Olympic Team, Patterson placed 14th in the downhill at the Innsbruck Games. The year, 1976, was a good one for Patterson, placing 2nd in the U.S. National Giant Slalom Championships at Copper Mountain, Colorado, 5th in the World Cup Combined at Kitzbuhel, Austria, 1st in the Spring Series Slalom at Mission Ridge, Washington and 1st in Slalom, Kandahar of the Andes Series at Bariloche, Argentina. Injury again struck Patterson on the eve of the 1978 Nationals at Lake Placid, New York where Peter suffered a broken femur in the giant slalom on February 23. About half of Peter’s career was spent recovering from injuries. However, this spunky skier always managed to come back. After his injury at the U.S. National Championships in Lake Placid, Patterson would ride his bike wearing a full-length cast that had plastic joints at the knee and ankle allowing him to train for the next racing season. In 1980, at XIII Olympic Games in Lake Placid, New York, Peter took 5th in the Olympic Downhill. Peter Patterson was elected to the U.S. National Ski Hall of Fame in 1978. If you notice any errors or inconsistencies in Peter Patterson's bio, click here to let us know.